Through the Reformation we learned that we are saved entirely, confidently and unfailingly..
..the church found again a love for the scriptures..
..the vast mass of people across Europe and then around the world were drawn to receive the fruits of a missionary movement..
“What is there not to like?” he asked, bouncily. With new vigour came conflict. With individual understanding of grace came individualism and division. With literacy and freedom came new ways of cruelty refined by science. With missionaries bearing the faith came soldiers bearing the flag. And suddenly the Archbishop became old, grey and stuffed. And this is the problem with the Reformation: when you write or preach about it with orange and black stripes, large eyes and a springy tail, you attract gloom and thistles. And when you write about the gloom and thistles, you’re met with a huge roar and an extract of malt. 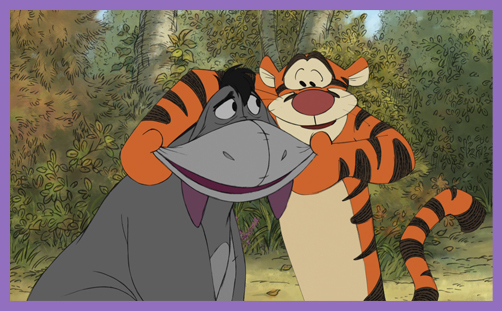 Tiggers like everything (except honey, acorns and thistles); Eeyore likes thistles, but the best diet of all is gloom and sorrow. The Reformation was a gift of God, not only in itself but as a sign of the faithfulness of God to His work of revealing the good news of Jesus to a world in need, and the faithfulness of God in using His church despite our failings. What do we do with the gift today? Will we be willing ourselves to be reformed again and always, setting aside our differences because we are caught up in the grace that is found through faith? Will we find from God alone the strength and grace to be a united blessing to His world, so that our witness of unity in diversity overcomes our fears of each other? Will we seize afresh in confidence the hope that God who never abandons His church will again reform us, so that the world may see that Jesus came from the Father? And therein lies the Eeyore challenge to all Christians: are we so perfect that we no longer need reforming? How can we reform when we cannot even agree on the model of reformation? It is already happening in so many ways, and so much has been accomplished. But we have not yet allowed ourselves sufficiently to be captured by the radicality of the gospel that we may bless the world as we should. As we surrender to the God who rescues us sinners, we will most surely find our vocation as the messengers of good news to the world. The radicality of the gospel? Ohhh-kayyy. What says Piglet? What says Roo?